Cuba, late spring 1952. The Finca Vigía had been plagued by a series of break-ins. Hemingway and his 12-gauge Scott were on guard. One night in January ’53 thieves entered the house again. Ernest heard them, slipped out of bed, picked up a .22 rifle and fired a shot at the last one escaping out this bathroom window. Mary wrote that the next morning they found blood on the terrace outside. 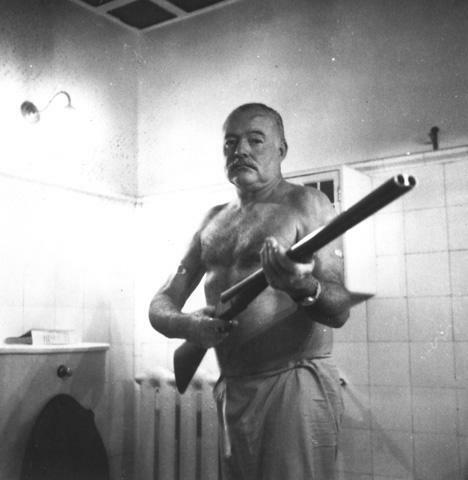 When Ernest Hemingway took his own life on July 2, 1961, it was reported in Life magazine that he had done so with a “double-barreled shotgun.” Further reports specified the gun was a Boss that he had purchased from Abercrombie & Fitch, and for years this has been widely accepted as fact. But a fascinating new book, Hemingway’s Guns, by Silvio Calabi, Steve Helsley, and Roger Sanger (Shooting Sportsman Books), makes the case that Hemingway never owned a Boss, and that the suicide gun was actually made by W. & C. Scott & Son. It was Hemingway’s pigeon gun, a long-barreled side-by-side that traveled with him from shooting competitions in Cuba to duck hunts in Italy to a safari in East Africa. By all accounts it was a favorite. Not long after that tragic day in Ketchum, Idaho, the gun was given to a local welder to be destroyed. “The stock was smashed and the steel parts cut up with a torch,” the authors write. “The mangled remnants were then buried in a field.” Roger Sanger visited the welding shop, which is still in business and being run by the grandson of the original proprietor. Amazingly, the welder still had a few pieces of the gun in a matchbox, and Sanger’s immediate reaction to the evidence was, “This is no Boss.” After showing pictures to a number of experts and collectors, he confirmed that it was most likely Hemingway’s beloved W. & C. Scott that had been the suicide gun. Hemingway’s Guns has many more revelations, and it says a lot about a man who spent much of his life in the company of firearms, from the Markham King air rifle he was given at age 5 to the Thompson submachine gun he used to drive sharks away from a trophy marlin. The photographs alone are worth the price of admission, a unique look at the evolution of a legendary sportsman. To see a photo gallery of Hemingway and the Scott pigeon gun, including pictures of the fragments found by the authors, click here.